How Much Do You Know About the Fiber Optic Cable? A fiber optic cable is a network cable that contains strands of glass fibers inside an insulated casing. These fiber optic cables are designed for long distance and very high bandwidth network communications. The optical fiber elements are typically individually coated with plastic layers and contained in a protective tube suitable for the environment where the cable will be deployed. Different types of cable are used for different applications, for example long distance telecommunication, or providing a high speed data connection between different parts of a building. Fiber optic cables carry communication signals using pulses of light. While expensive, these cables are increasingly being used instead of traditional copper cables, because fiber offers more capacity and is less susceptible to electrical interference. So called Fiber To The Home (FTTH) installations are becoming more common as a way to bring ultra high speed Internet service to residences. What are the color codes for fiber optic cable? The fibers in optical fiber cables are numbered according to their color code, which simplifies connecting hardware installation and connector termination as well as further administration and testing of the cabling system. The fibers are numbered in accordance with the individual standard color code given in figure 1. 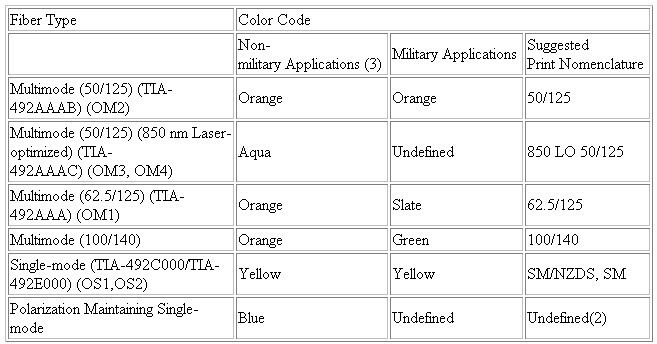 250- and 900-micron buffer coatings are subject to color-coding. In modular design multifiber cables, the same color coding is applied with respect to modules. In loose tube cables, with over 12 fibers in one tube, fibers can be combined to form a single unit fixed by colored threads. In some cases to facilitate pair grouping the fibers are painted the same colors with collar marks every 2-3 cm (0.8 – 1.2 in) on the second fiber of the pair. When colored jackets are used to identify the type of fiber in cable containing only one fiber type, the colors shall be as indicated in Table 1. Other colors may be used providing that the print on the outer jacket identifies fiber classifications in accordance with subclause 4.3.3. Such colors should be as agreed upon between manufacturer and user. When the print on the outer jacket of premises cable is used to identify the types and classifications of the fiber, the nomenclature of Table 3 is preferred for the various fiber types. Distinctive print characters for other fiber types may be considered for addition to Table 1 at some future date. 1. Natural jackets with colored tracers may be used instead of solid-color jackets. 2. Because of the limited number of applications for these fibers, print nomenclature are to be agreed upon between manufacturer and end-user. 3. Other colors may be used providing that the print on the outer jacket identifies fiber classifications. 4. For some premises cable functional types (e.g, plenum cables), colored jacketing material may not be available. Distinctive jacket colors for other fiber types may be considered for addition at some future date. To understand how a fiber optic cable works, imagine an immensely long drinking straw or flexible plastic pipe. For example, imagine a pipe that is several miles long. Now imagine that the inside surface of the pipe has been coated with a perfect mirror. Now imagine that you are looking into one end of the pipe. Several miles away at the other end a friend turns on a flashlight and shines it into the pipe. Because the interior of the pipe is a perfect mirror, the flashlight’s light will reflect off the sides of the pipe (even though the pipe may curve and twist) and you will see it at the other end. If your friends were to turn the flashlight on and off in a morse code fashion, your friend could communicate with you through the pipe. That is the essence of a fiber optic cable. A transmitter is a device found at the beginning of a fiber optic cable network. The transmitter takes information and turns it into a pulsing light wave that can be sent along a fiber optic cable. A lens is then used to send the light into a fiber optic cable. The light will travel along the fiber optic cables more quickly and with less signal degradation than occurs when sending data along traditional coper wires. The core of a fiber optic cable is made of a very clear glass tube that transmits light. This glass core is surrounded by a coating called cladding. Light will travel down the fiber optic tube in a straight line. Unfortunately, not all fiber optical cables can be laid along a straight path, so the cladding surrounding the cable is mirrored. The light bounces off of the mirrors on the cladding and is directed back into the fiber optic core to continue its journey along the cable. Sometimes a light signal must travel through a fiber optic cable over a very long distance. Although signal degradation is minimal in a fiber optic cable, some degradation does occur. When a cable covers a long distance, optical regenerators are placed at certain intervals along the cable. Optical regenerators are fibers that have been treated with a laser. The molecules in the fiber allow the signal traveling through the fiber optic cable to take on laser properties themselves, which strengthens the light signal. Optical regenerators essentially strengthen the light signal that is traveling through a fiber optic cable. At the end of the fiber otic network there is an optical receiver. This receiver is essentially performs the opposite function of the transmitter found at the beginning of the system. Optical receivers receive the light signal from the fiber optic cable and turn it back into information that a computer or television know how to understand and use. It then sends the decoded signal to the computer or television. FiberStore have many types of loose tube fiber optic cables, such as All -Dielectric Loose Tube Cables, Gel-Filled Loose Tube Cables, Double-Jacket Loose Tube Cables, Central Loose Tube Cables. Synchronous Optical Networking is usually called SONET for short. The SONET standards were coded in the mid-1980s to consider benefit of low-cost fiber optic transmission. It defines a hierarchy of data rates, formats for framing and multiplexing the payload data, as well as optical signal specifications (wavelength and dispersion), allowing multi-vendor interoperability. SONET may also be referred to as “T-1 on steroids”. Can you explain that? As you may know, the digital hierarchy (DS-0, DS-1, DS-2, DS-3 and much more) was created to provide cost-effective multiplexed transport for voice and data traffic from one location inside a network to a separate. SONET and SDH (Synchronous Digital Hierarchy) are two equivalent multiplexing protocols for transferring multiple digital bit streams using lasers or LEDs (light-emitting diodes) over the same optical fiber. They were made to replace PDH (Plesiochronous Digital Hierarchy) system to get rid of the synchronization issues that PDH Multiplexer had. SONET is synchronous, which means that each connection achieves a continuing bit rate and delay. For example, SDH or SONET might be utilized to allow several Internet Service Providers to talk about exactly the same optical fiber, without being affected by each others traffic load, and without having to be able to temporarily borrow released capacity from one another. SONET and SDH are considered to become physical layer protocols since they offer permanent connections and do not involve packet mode communication. Only certain integer multiples of 64kbits/s are possible bit rates. SONET is really TDM(time division multiplexing) based and this causes it to be readily supported fixed-rate services such as telephony. Its synchronous nature is designed to accept traffic at fixed multiples of the basic rate (64kbit/s), without requiring variable stuff bits or complex rate adaptation. The SONET data transmission format is based on a 125us frame composed of 810 octets, of which 36 are overhead and 774 are payload data. The fundamental SONET signal, whose electrical and optical versions are referred to as STS-1 and OC-1, respectively, is thus a 51.84Mb/s data streams that readily accommodate TDM channels in multiples of 8 kb/s. It is important in fiber optic network that SONET can be used to encapsulate PDH and other earlier digital transmission standards. It is also used directly to support either an ATM (Asynchronous Transfer Mode) or packet over SONET/SDH (POS) networking. So SONET/SDH is actually a generic all-purpose transport container for moving both voice and knowledge traffic. They in themselves aren’t communications protocols. SONET brings by using it a subset of benefits that make it differentiate themselves from competitive technologies. These include mid-span meet, improved operations, administration, maintenance, and provisioning (OAM&P), support for multipoint circuit configurations, non-intrusive facility monitoring, and the capability to deploy a variety of new releases. Improved OAM&P is among the greatest contributions that SONET brings to the networking field. Element and network monitoring, management, and maintenance has always been something of the catch-as-catch-can effort due to the complexity and diversity of elements inside a typical service provider’s network. SONET overhead includes error-checking ability, bytes for network survivability, and a diverse set of clearly defined management messages. Media reports fully proved Google is by trying to get people to think more seriously about Google’s fiber optic network project to get it regarded as a major broadband company, although not always the case. Technology News clearly states: This network was initially seen as what the Internet giant used to test its news services and advertising model as an experiment network. Others also would like to know if Google network is just is a mean to promote the existing cable TV and phone companies to provide faster Internet service. Obviously, it was agreed that Google as a rich and powerful technology giant is affordable with this project and simply credited the cost as research and development expenditures. It is not important that how we call it. Google Fiber MiloMeldin (formerly known as @Home) participate in the association meeting on FTTH in North America this week, and reiterated Google fiber network is a serious money-making initiatives. During the meeting, other than repeatedly requesting for subsidies, deregulation or complaining the poor service (just like the attitude of telecommunication industry’s mobile operators towards the large carries), Google in turns insisted that the earnings of working with the local government is rather abundance. To be specifically, Google requires Kansas City as the assigned inspector for the Google Fiber project construction to enable speedy completion of the city’s periodic inspection, which will further saves the time and money that Google invest I the construction phase. This company also requires deploy fiber in other cities’ piping, and minimizing the unnecessary street excavation projects. The company has cooperated with the public utility companies to get the supported base station location for connections of the new fiber optic network. Despite all these sound very good, but as of now, Google has not disclosed any convincing financial data, and Google Fiber has not yet been deployed on a large scale in families except a few part families. Although it is welcomed that Google Fiber intended to break the duopoly U.S telecommunication market, it is still a long way to go if it let people to see it as a real player in the market and a truly disruptive market forces.